As a loud and speedy “switch-off the brain” type of movie, Fast Five (the fifth in The Fast and the Furious series) is entertaining. It has charismatic characters, gunfights, parkour foot-chases, daring heists, insane driving, car crashes, and big stunts. The biggest draw for me, though, was a promised brawl between macho titans Vin Diesel and Dwayne Johnson (I abhor real-life violence but am a sucker for a good fight scene…I can’t explain it). That scene, despite being filmed too closely and over-edited, is a crowd-pleasing display of physicality. With all of these elements, were I fifteen years old again Fast Five would be one of my favorite movies. These days, however, for an action film to truly leave its mark it needs substance, intelligence, and morality. Fast Five makes attempts at dramatic weight with themes about the value of loyalty to family and friends, planning for the future, and mourning the loss of loved ones. Sadly, while the actors have chemistry and personality, they are not up to the task of giving these themes much resonance, and neither is the script. The action scenes, while truly astounding, ignore both the laws of physics and human capacity for survival. That’s fine; I’m not someone who demands realism from action films, but in exchange for larger-than-life escapism Fast Five lowers its stakes. If all of the main characters can survive the un-survivable then there’s no real sense of danger. If civilians always just barely jump out of the path of destruction carved by our reckless heroes, then the latter maintain their honor, but only in a completely unbelievable world. Whatever overtures the film makes about honor and heart are lost when it brands itself as an over-the-top, guilty-pleasure movie. Also, though the film attempts to paint these characters as some type of noble criminals, their motives are ultimately shallow: get rich, get revenge, and avoid arrest. Like a strawberry Pop-Tart, Fast Five is enjoyable but pretends to have more substance than it actually does. But then, junk food does hit the spot from time to time. 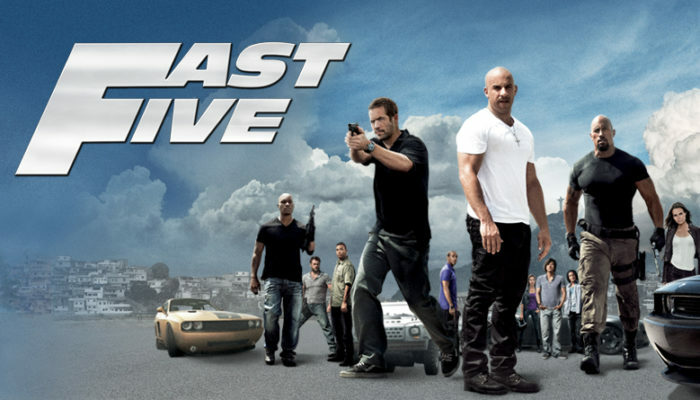 CONTENT ADVISORY: Fast Five is rated PG-13. Parents should be advised that it contains a considerable amount of violence and mayhem. Though the “heroes” do seem to value innocent life, a villain brutally murders an employee for failing him (though the actual death occurs just off-screen) and a protagonist shoots a villain in cold blood. There are fistfights and shootings. There is a moderate amount of language, including one f-word. Women are objectified and sexualized in several completely gratuitous shots of scantily-dressed bodies. Thieves and criminals are glamorized. MESSAGES TO DISCUSS: Family matters most; take care of your children. Despite what is seen in movies, in reality there is very little honor among thieves. For another action-packed Dwayne Johnson movie, I highly recommend the very funny flick The Rundown.